Jude reviews: The Life of Jude. It gives me great pleasure to inform you that your manuscript, The Life of Jude, has received first prize in the FAW National Literary Award, the Jim Hamilton Award. This award is open to full-length works of fiction or poetry either published or unpublished in the year of competition. Congratulations on your success. Clare Mendes, author and coordinator of the Fellowship of Australian Writers national literary awards. A very accomplished piece of writing that absorbed the reader throughout. Polished in style and execution, seamlessly weaving fact and fiction to tell the story of a man beyond time and place. A captivating journey back in time. Archimede Fusillo, author and judge of the FAW Jim Hamilton Award. This is such a good concept, Brian. It’s 1.30 in the morning and I’m sitting up in bed reading. I couldn’t put it down, You have a gift with words and a story that’s never been told, but should be. I happen tp know there is a huge market waiting for this book and I would love to handle it as your agent. The late Jane Jordan Browne, literary agent, Chicago, in a phone call to Sydney. The novelization of the life of Jude is a very good idea. He is one of the most popular Christian saints, and the market for such a book would therefore be considerable. Jeffrey Essman, Doctor of Divinity, Chicago. This book is full of breath-taking highlights. You have impressed me with the evidence of very thorough research. You have found a popular topic to bring to light – a fascinating topic. You do a great job of painting the scenery in Jude’s travels, and the characters he meets. The reader actually witnesses the story of Christianity being spread, and the struggles Jude and others went through to do it. You also paint the conflict between the cultures most vividly, a technique that is necessary to show Jude walking into a spiritual and physical battlefield. I don’t very often get this excited about a work in progress. Brendan Longcore, book editor, reviewing part of the draft manuscript. I love what you have written. So many cultures, so much research… my God. Many, many people have waited a long time for this story. 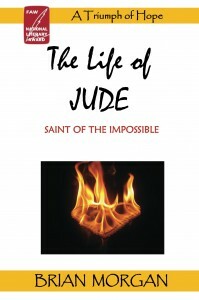 Jude is so popular, as the Saint of the Impossible and the Patron of Desperate Cases, all over the world that your book cannot fail to sell everywhere. And it’s not just the story… you write so very, very well. Joyce Patterson, reviewer and former editor. This is a very impressive effort. You have written a story never before told in a way that is uniquely yours. I understand your research alone, before you put pen to paper, took forty years (part-time of course). I doubt if anyone else has assembled this amount of information about the saint. A highly commendable project that deserves a wide readership. Don Purvis, Professor of English Liteerature. Good religious books are always in demand, especially if they are well written and the premise is sound and logical, as yours is. Your style is beautifully polished and easy to read. Vera Thompson, editor and book publisher. Suddenly, St Jude is hot. Maybe it’s a resurgence of hopelessness and desperation, but this Saint of Last Resort is becoming the man of the moment. He’s got web sites. He’s got celebrity followers. Not to mention fan clubs. You can even send Jude postcards over the internet. Ellen Warren, staff writer, Chicago Tribune, commenting on the wide interest in Jude. Abraham Castro on Amazon, Kindle edition. Like to return from Reviews: Life of Jude to the Brian Morgan Books Home Page? Prefer to return from Reviews: Life of Jude to the Published books page?